The Club welcomes all genuine naturists and those visitors who are genuinely interested in trying a naturist swim session. Also please note that membership of the Spectrum Facebook group does NOT automatically grant you the right to visit the swim. Most naturist clubs operate a system of asking visitors to complete a number of trial visits before offering membership and Spectrum is no exception. If you are interested in joining Spectrum, please complete the form below and we will post you an information and application pack. Please bring your application form with you on your first visit. You will be asked to complete 4 satisfactory visits before being considered for membership. That gives you the opportunity to decide whether Spectrum is the club you are looking for. Although applications for membership need to be approved by the elected committee, we try to keep everything informal. There are no membership interviews. Once your membership is agreed, the membership fee becomes payable. 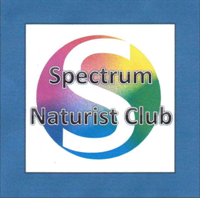 Very occasionally we do have people who come along looking for something more than the straightforward naturism on offer at Spectrum. Not only will they be disappointed, they can also expect to be shown the door before they get the chance to complete their four visits! Sessions - £5.00 members; Visitors seeking membership £5.00; occasional visitors and members' guests £6.00. Tell us a little bit about yourself, and why you would like to visit the club?